(P1) A French cyclist has set a new record for riding 14 miles in one hour. If that doesn’t sound so remarkable, the world record is 33.8 miles, consider the category in which Robert Marchand was competing: over 105. 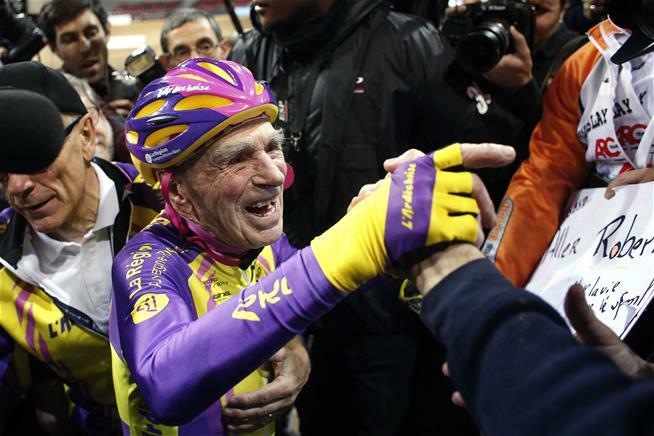 The retired firefighter did it the first time riding in under one hour in the over-100 category in 2012, then topped it two years later at age 102, the Guardian reports. He also holds the 100-plus record for fastest 100km (4 hours, 17 minutes). He turned 105 a few months ago and competed Wednesday in the new category created just for him. Marchand circled the Saint-Quentin-en-Yvelines velodrome near Paris 92 times with a crowd cheering him on. In your opinion, why do you think the cyclist was able to set a new record in cycling? If you were over 100 years old, do you think you could accomplish the same thing Mr. Marchand did? Why or why not? Do you think the elderly should be encouraged to exercise more? Why or why not? When Mr. Marchand was working, he used to be a ______________. How many times did the cyclist go around the bicycle track in France? What disease affects Mr. Marchand? In the past, Mr. Marchland cycled from __________ to ____________. Why did Mr. Marchand quit eating meat?